Green-fingered and threatened plant scientist Dr Peter de Lange from the Department of Conservation on the great bio-mass that grows around us... so, what is a plant?!" 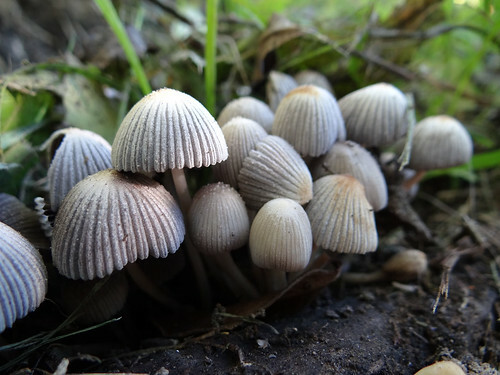 We now have an easy blogging format on FUNNZ.org.nz where you can add your notes on all things mycological. Jerry Cooper has already added ten posts on everything from Frost flat fungi to the Yin-Yang fungus. New Zealand fungi on RadioNZ "This Way Up"
This afternoon the Radio New Zealand National show "This Way Up" had a 31 min feature on NZ fungi and foraying. Read more about New Zealand fungi on RadioNZ "This Way Up"
Flickr is a photosharing website, and there is a group there dedicated to photos of NZ fungi: http://www.flickr.com/groups/nzfungi/ This picture of Coprinellus disseminatus is one example of the great photos available on the Flickr website. Welcome to the newly designed FUNNZ website. The website uses the Drupal content management system, which makes it really easy for users to add, edit, and comment on pages. To comment and vote in polls you need to sign in, but I have made this as easy as possible, by using OpenID, so you can sign in with your google account or similar (if you want to). Full instructions on how to do that are here. How we use the website is really up to you. If people want it I can also enable discussion forums.